Tullow Oil says work to rectify problems with the turret systems on the Jubilee FPSO is on course, with the vessel set to be spread-moored on its current heading by the end of January. This will allow the tugs required to hold the vessel on a fixed heading to be taken away, reducing the complexity of the current operation. The next priority will be modifications to the turret systems for long-term spread-moored operations. Tullow continues to assess the optimum long-term heading to determine whether a rotation of the FPSO is necessary. The partners are in discussions with the Ghanaian government, with the program likely to start during the second half of the year. This may lead to a shutdown of the FPSO for up to 12 weeks, although the partners are looking at possible ways to minimize any shutdown period. As for the nearby TEN development that started up last August, the oil production, gas compression/injection, and water injection systems are all commissioned and operational. Earlier this month the capacity of the FPSO was successfully tested, with average flow rates of more than 80,000 b/d during a 24-hour trial. Production testing and initial results from the 11 wells indicate reserves estimates for the Ntomme and Enyenra accumulations are in line with expectations. However, due to some issues with managing pressures in the Enyenra reservoir and because no new wells can be drilled until after ITLOS has ruled on a maritime border dispute with Côte d’Ivoire later this year, Tullow plans to manage the existing wells carefully. Gas production from the TEN fields is currently being re-injected, with gas export set to begin later this year. Offshore the north coast of South America, Tullow is involved in plans to drill the potentially high-impact Araku prospect offshore Suriname during the second half of 2017. Off neighboring Guyana, planning continues to acquire 3D seismic data over the offshore Kanuku and Orinduik licensesupdip of ExxonMobil’s Liza oil discovery. 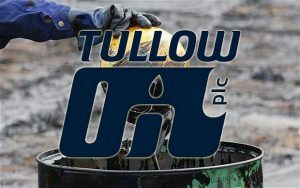 Finally, Tullow has completed divestment of its Norway business after selling four licenses to Statoil and eight others toAker BP, with three more sales executed in December expected to go through during the first half of 2017.